All of our products are designed and manufactured to last a lifetime and it’s important to us that every system works perfectly when it’s installed. We offer a design service for installers, covering every frost heave and condensation prevention system that we supply. 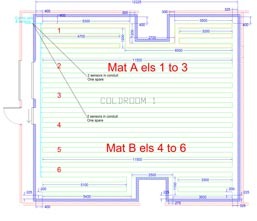 If you tell us the dimensions and structural layout of the cold store, we will work out the optimal configuration and provide you with detailed plans and installation instructions. No matter where in the world you are located, we can provide the support you need. Our team is available by email, phone and Skype.